"Wabbit’s Cola all round!" 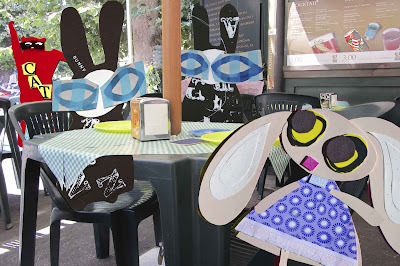 said the Wabbit who had repaired to a very favourite caffè with which he had a convenient arrangement. The day was hot and the street was noisy. But above the din the Wabbit heard a familiar voice and turned to see Skratch bearing down on his table. "No, no Wabbit! They charge €3 for a Cola here!" Skratch yelled. "That’s because we’re sitting down and they bring delicious food with our drinks," said the Wabbit with an approving nod. "I don’t like coming here, they won’t let me pay," said Wabsworth, "apparently my money’s no good here." The Wabbit grinned. "I’ll bet you bring the money later and put it under the door." "I most certainly do," said Wabsworth, "how did you know?" "Lucky guess?" 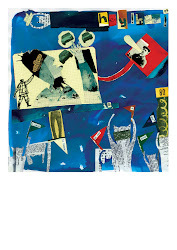 shrugged the Wabbit, winking at Skratch and turning back as Lapinette signalled everyone’s attention. "While I’m ordering Wabbit’s Colas, you decide what kind of adventure that was," she said brightly. "OK," said the Wabbit, "any suggestions?" "It could have been a disaster movie, with all these cans zooming around," said Lapinette over her shoulder. “Proceeding around," said the Wabbit. "They had purpose and direction," "Just like you?" smiled Lapinette. "Just like me!" beamed the Wabbit and they all laughed and laughed and laughed.